Complete Canine's Dog Daycare is a place for dogs to have fun in a safe and caring environment while you can't be with them. When your dog comes to Complete Canine for daycare, he or she will be integrated into the supervised play group that best suits him. This is done carefully and at a pace within each dog’s comfort level. 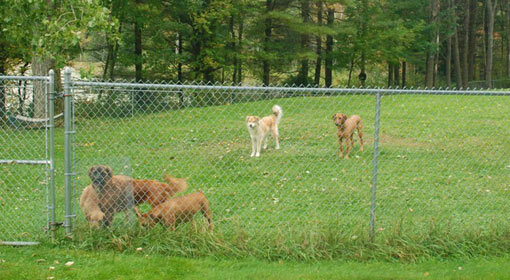 Groups are determined based on factors such as size and temperament. Your dog will also have rest time during the day. We have separate play area for big dogs and small dogs. Interaction with other dogs to build positive social behavior and alleviation of boredom by playing with other dogs. Some dogs may go out alone if that works better for them. Good behavior and manners are promoted. Pets must be current on Rabies, Distemper and Kennel Cough vaccines. You are welcome to drop off or pick up your dog anytime during these hours! Special arrangements can be made for earlier drop offs or later pick-ups.